Shortbread cookies: a portrait of simplicity framed by irresistible decadence. 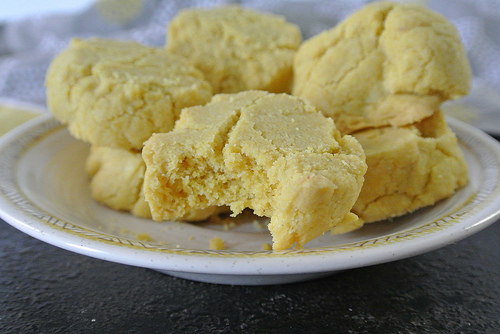 This cornmeal-bourbon shortbread features rich olive oil, fluffy white flour, crunchy yellow cornmeal, and under it all, whiskey notes from using a homemade bourbon syrup as the sole sweetener. (We resisted the urge to add lime zest, but certainly wouldn't judge you for going for it.) Feel free to swap out maple syrup if you prefer, but the bourbon syrup is great to have on hand if you can afford to splurge on making a batch. Drizzle it as-is over Johnnycakes, cut it with maple syrup for pancakes, or combine it with balsamic vinegar for an ice cream topping or a glaze for roasted vegetables. A bit crisp on the outside, tender inside, rich, and flavorful, the cookies are seriously addictive. Plus, since they call for liquid fat in the form of olive oil, the dough mixing is effortless. They're easy enough to whip up on a weeknight and elegant enough to offer guests. Savor one alone, or with a cup of coffee, or pair them up with other treats. In fact, we're pretty sure this recipe will reappear more than once this autumn and winter as a tart crust. A note on shaping: These can be shaped at the time of mixing by manually forming patties. This produces a more dome-shaped cookie (as seen in the ice cream sandwich photos). Alternately, the dough can be formed into a log and chilled, then sliced with a very sharp knife (we used a large bread knife) into rounds. The chilled cookies are closer to a traditional shortbread, keeping a more uniform shape and a slightly firmer exterior (see top photo). Both methods work. If you'd rather get your hands dirty or are short on time, shape immediately. If you prefer to wait for simpler shaping, chill the dough. Preheat oven to 350 (if shaping immediately--see note above--if not, wait until the dough has finished chilling before heating the oven). Whisk together the cornmeal, flour, salt, and baking soda. In another bowl, whisk together the oil, syrup, and vanilla. Add wet ingredients to dry and stir until fully incorporated. You'll get a sandy mixture that holds together when squeezed. Form the cookies into 12 2-inch patties, transfer to a nonstick cookie sheet, and bake 15 minutes. Let cool on the pan 5 minutes (this ensures the cookies bind fully). Transfer to a wire rack to cool completely. Alternately, form the dough into a log 2 inches thick (about 7 inches long). Roll up in plastic or foil, chill for one hour, and with a very sharp knife, slice into 12 rounds. Bake as directed above. Combine all ingredients in a small saucepan. Bring just to a boil, reduce heat, and cook at a low simmer for 10 minutes, until thickened and syrupy.